Chevrolet has advertised some impressive feats for its new Voltec 2 EREV drivetrain, which will power the 2016 Volt upon its release: a 100-pound weight reduction, broader torque curve, 0 to 30 acceleration in just 2.6 seconds (almost as quick as the base Tesla Model S, at 2.5 seconds), etc. Ever wonder how GM managed to pull it all off? We’re here to tell you, in (hopefully) the simplest terms possible. 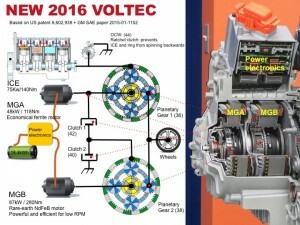 According to an exposé on gm-volt.com, the new transmission in the Voltec 2 system features an integrated inverter, which cuts down on weight by ridding of the separate inverter unit and big, heavy cables. The larger 87 kW (117 HP) drive motor has seen its rare earth metal content decline by 40%, while the smaller 48 kW (64 HP) motor now uses none at all. 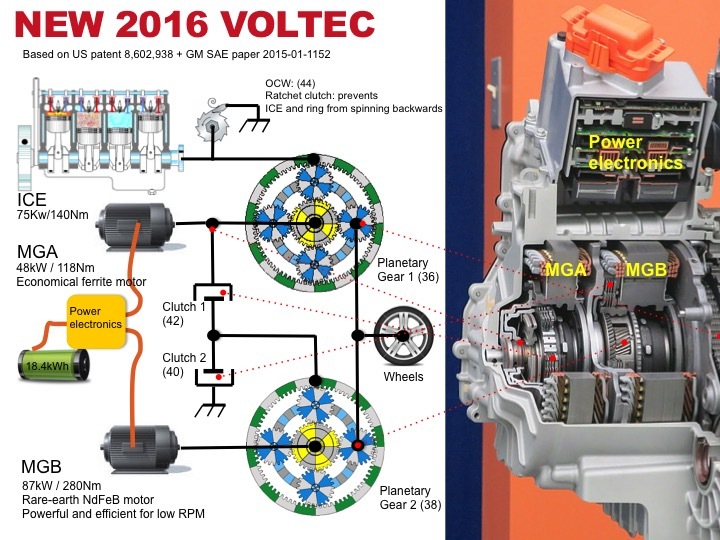 More importantly, the new Voltec 2 transmission can now additively utilize both electric motors together, so that the total power output is higher than that of the old 111 kW (149 HP) motor, with a broader torque band. Getting more into the specifics of the transmission, it has three clutches in total; the third of these, which enables engagement of the internal-combustion engine range extender, is a ratcheting type, to prevent backward spinning while the electric drive motors are producing torque. Through strategically actuating all three clutches to achieve different torque-flow paths, the 2016 Chevrolet Volt will be capable of a total of five different drive modes: two electric, and three mixed “extended” modes. Note that these five modes aren’t those which can be called upon explicitly by the driver within the Volt’s menu system – i.e. Normal, Eco, Sport, etc. – but rather they’re power-flow strategies called upon by the car, based on whether the range-extender is operating, vehicle speed, and/or driver torque requests (throttle position). This is a diagram of the Voltec 2 propulsion system. If looking at this image makes you sad, angry, or hostile, you are not alone. Note that motor “MGA” is the one nearer the internal-combustion engine. First, some background: the two motors in the new Voltec 2 system have nicknames. The less potent, at 48 kW, is dubbed “MGA,” where the more powerful of the two, at 87 kW, is called “MGB.” In both all-electric driving modes (named CD1 and CD2), MGB is powered, whereas the smaller MGA only turns in the higher-output CD2 mode. Getting back to those two previously unexplained clutches: when closed, Clutch 1 connects the outer ring gear of the MGB planetary set to the central sun gear of the MGA set. Clutch 2, meanwhile, locks the outer ring gear of the MGB set to the outer case, preventing it from turning – only MGB’s sun and planetary gears are allowed to rotate when engaged. So, the lower-output CD1 drive mode leaves Clutch 1 disengaged, and engages Clutch 2. This means that the 87 kW MGB motor turns the sun gear, which multiplies the torque through its planetary gears, who in-turn rotate the drive shaft. Got it? Good. The higher-output CD2 electric drive mode has the same engagement pattern as CD1 for these clutches, but both MGA and MGB are providing torque, through their respective planetary gears, to the drive shaft. And because the gear ratios are slightly different for the two electric motors, a broader torque band is enabled, so that decent torque is possible even after one motor is spinning past its peak RPM. This technical deep dive has been split into two parts for easier consumption. Move on to part 2 for the rest of the story. On the jou screwdriver channel of roku there is a series of u.s. Army training films, from the 50’s I beleive, explaining how planetary gearsets interact when input and output shafts are allowed to freewheel, or are locked together and tied in series or parallel. Complicated but the training aids are well designed to visually explain. Not to mention how the noncoms handle the pointer in a military manner!